Temperature has a profound impact on the quality and delivered freshness of fresh produce and perishable foods. But how much of an impact? Intelleflex and ProWare Services recently published a case study that documented the impact of temperature on fresh berries being shipped from Mexico into the United States. Between the fields and the packing house and the packing house to the distribution centers, temperature conditions varied widely, affecting shelf life and shrink. 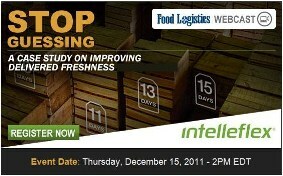 In conjunction with Food Logistics Magazine, Intelleflex is presenting the results of this case study on a December 15 webinar. You can register for the webinar by clicking here. Shrink begins in the field as temperature variations and transportation times to the packing house are significant. Proper pre-cooling plays a huge role in relative shelf life. Knowing the temperature history of each pallet enables you to dynamically route based on relative shelf life. In-transit conditions vary significantly in trailers – by as much as 30%. You can cost-effectively reduce shrink and improve delivered freshness. I hope you’ll be able to join us on December 15. I think you’ll find the case study data invaluable and compelling.